Dustin Jorgenson, owner of Jorgenson Companies, has always enjoyed the thrill of competition. “The more intense the better!” he shares. Whether he’s at the office during the day or on the court at night, Dustin carries that attitude with him to reach his goals. 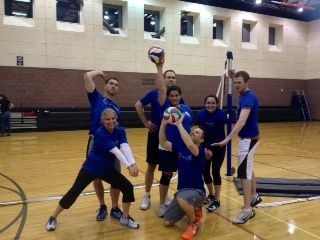 And it’s that attitude that helped lead our Jorgenson Companies sponsored volleyball team to their first-place finish in the local winter coed volleyball recreation league. This entry was posted in Company News and tagged Jorgenson Companies, Salt Lake City, volleyball on April 10, 2013 by admin.